This stretch is performed in the seated position. Cross your affected foot over the knee of your other leg. Grasp the toes of your painful foot and slowly pull them toward you in a controlled fashion. If it is difficult to reach your foot, wrap a towel around your big toe to help pull your toes toward you. Place your other hand along the plantar fascia. The fascia should feel like a tight band along the bottom of your foot when stretched. Hold the stretch for 10 seconds. Repeat it 20 times for each foot. This exercise is best done in the morning before standing or walking. Cortisone injections. In plantar fasciitis treatment, walking may cause overstretching of your leg. When you walk, walk gently without straining your heels. Another thing to remember is to avoid walking on hard surfaces and always opt for proper well cushioned shoes. Old and worn out shoes must be avoided which can cause discomfort while walking. 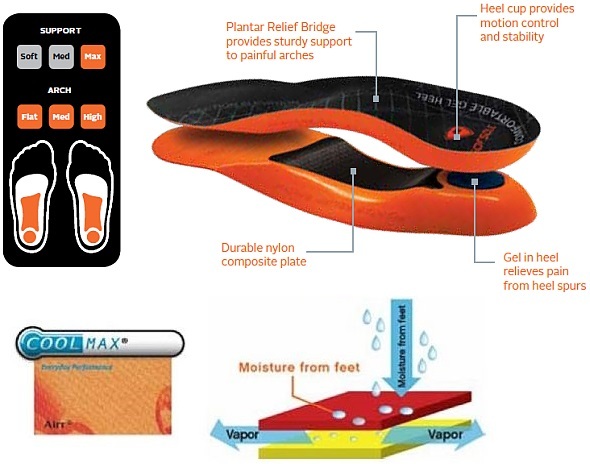 There are heel pads and cushions available which help provide support to the heels and feet. There are painkillers and other anti-inflammatory drugs that relieve the throbbing pain. In addition, there are certain plantar fasciitis exercises like stretching exercises. However, these exercises must be performed in supervision of a physiotherapist. The treatment of plantar fasciitis may include non-steroidal anti inflammatory such as Ibuprophen, or Naproxen, rest, ice and heat modalities, or orthotic devices for shoes to provide arch support. Your doctor may inject your foot with corticosteroids or prescribe a corticosteroid cream which may provide relief. If you're overweight diet to normalize your weight may be suggested. Exercises to stretch the plantar fascia and strengthen the lower leg muscles may be suggested. Night splints which hold your foot at a 90 degree angle may be suggested to keep the plantar facia lengthened at night allow for greater stretching and decrease morning pain. Inappropriate footwear is the No. 1 cause of plantar fasciosis. Footwear that possesses toe spring and a tapered toe box holds your big toe in an adducted and extended position. In this position, your abductor hallucis muscle—the muscle responsible for moving your big toe away from your foot’s midline—pulls on a foot structure called the flexor retinaculum and may restrict blood flow through your posterior tibial artery, the vessel that carries blood to the bottom of your foot. Tissues in the sole of your feet begin to degenerate as blood supply to this area is decreased. Foot Orthotics , is the only non-surgical therapy to have been supported by studies rated by the Center for Evidence-Based Medicine as being of high quality. Landorf et al. performed a single-blind experiment in which patients were randomly assigned to receive off-the-shelf orthotics, personally customized orthotics, or sham orthotics made of soft, thin foam. Patients receiving real orthotics showed statistically significant short-term improvements in functionality compared to those receiving the sham treatment. There was no statistically significant reduction in pain, and there was no long-term effect when the patients were re-evaluated after 12 months. 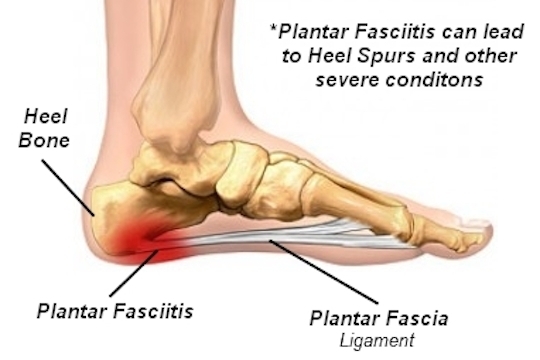 Plantar fasciitis is a painful inflammatory condition of the foot caused by excessive wear to the plantar fascia that supports the arches of the foot or by biomechanical faults that cause abnormal pronation. 1 The pain usually is felt on the underside of the heel, and is often most intense with the first steps of the day. It is commonly associated with long periods of weight bearing or sudden changes in weight bearing or activity. Obesity, weight gain, jobs that require a lot of walking on hard surfaces, shoes with little or no arch support, and inactivity are also associated with the condition. The pain associated with plantar fasciitis is typically gradual in onset and is usually located over the inner or medial aspect of the heel. Occasionally, the pain will be sudden in onset, occurring after missing a step or after jumping from a height. The pain is commonly most severe upon arising from bed in the morning, or after periods of inactivity during the day. Thus, it causes what is known as "first-step pain." The degree of discomfort can sometimes lessen with activity during the course of the day or after "warming-up", but can become worse if prolonged or vigorous activity is undertaken. For immediate pain relief, your podiatric physician can give you a cortisone injection. There are many conservative treatments for plantar fasciitis that when used accordingly are very successful. You should be icing and stretching the bottom of your foot daily. Your podiatric physician may refer you to a physical therapist to aid in your treatment and to teach you the most effective stretching techniques for your foot type and condition. You may also be advised to wear a night splint that stretches your tendons and fascia in your foot while you sleep. These treatments can significantly reduce the inflammation of your plantar fascia and thus reduce your pain.